Mudguards. They’re not very exciting, and some look plain hideous, but they can be pretty essential in the UK for stopping mud, pebbles and other debris hitting your face and body. So simple effective solutions that don’t deface or weigh down your bike are always welcome. 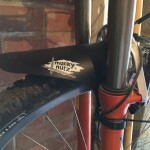 Ticking all of the above boxes, step forward the Bender Fender from MuckyNutz. Simple idea, slightly fiddly to fit, but cheap and very effective. Well priced and easy to use trailer. A hit with rider & passengers. I have 2 year old twin boys, and whilst they’re not old enough to cycle yet, that doesn’t mean they can’t be involved. I had seen quite a few people riding round our neighbourhood with trailers pulling their kids and thought it was a great idea. After a bit of research I decided to give Halford’s Double Buggy Child Bike Trailer a go.